This first generation of Anest Iwata Dry Scroll Pumps were called “A” series pumps. SynSysCo maintains all of these pumps. The “A” series pumps were sold as Edwards ESDP-12, ESDP-30, Varian DS300 and DS600, and Anest Iwata ISP-250A and ISP-500A models. These pumps are now legacy pumps and have been superseded by “B” and “C” series pumps. The major scroll module parts (FS1, FS2 and OS) are slightly different than the “B” and “C” series pumps and are not interchangeable with the “B” and “C” series. 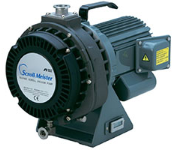 If a major scroll is damaged on an “A” series pump module, the module is NOT repairable. The Anest Iwata ISP250B and ISP-500B have several mechanical improvements and the scroll spiral is slightly different than the “A” series. The “B” series introduced the air flush circuit to assist in the removal of water from the scroll when they are in higher moisture applications. The “B” series also has an improved exhaust check valve assembly. For the ISP Series, the “B” and “C” series FS1, FS2, and OS components are interchangeable. So the older “B” series is able to be fully supported with “C” parts. The Edwards GVSP-30 is the Anest Iwata ISP-500B private labeled for Edwards. The Anest Iwata DVSL-100B and DVSL500B and DVSL501B have air flush circuits but the scroll components are now legacy products and are NOT able to be supported with DVSL “C” series parts. The latest generation of ISP pumps is the “C” series, which integrates the flush circuit into the scroll casting, thus eliminating a possible leak path associated with the “B” series air flush circuit. Anest Iwata “C” series models consist of the “Scroll Meister” models ISP-1000C, ISP-500C, ISP-250C, and ISP-90C. Leybold has these pumps manufactured for them by Anest Iwata and then labeled as the Leybold SC60D, SC30D, SC15D, SC5D. Ulvac has these pumps manufactured for them by Anest Iwata and then labeled as the Ulvac DISL-502, DIS-251, and DIS-90.